The Windows Explorer 7 toolbar includes various option buttons to select from. 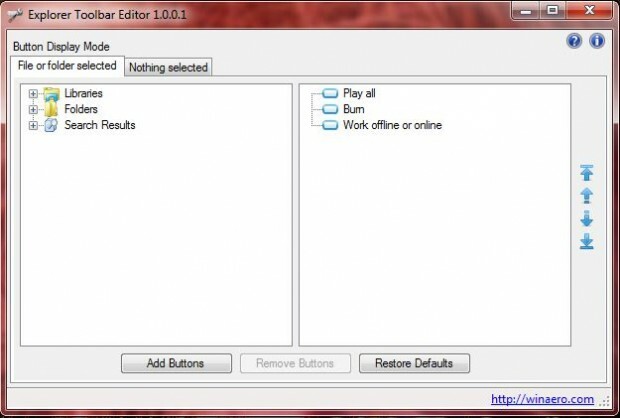 You can add more options to the toolbar, or remove them, with suitable third-party software packages. Among them is the Explorer Toolbar Editor software. You can add that software to Windows 7 from this page . Click on the Download Now button to save it as a Zip file. Then right-click on the Zip file, click Extract All and a select a suitable location for the folder. 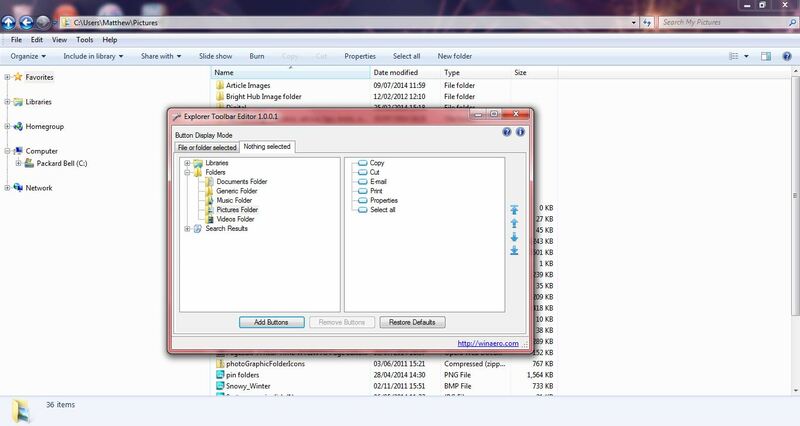 Open the extracted folder and click ExplorerToolbarEditor to run the software below. You have two tabs on that window. The File or folder selected tab means that buttons you add are only shown when you select a file or folder. The Nothing selected tabs means that buttons are only displayed on the toolbar when you have not selected anything in the folder. To configure the toolbar with new options, select one of those tabs and then a suitable folder/library from the directory tree. You can select multiple folder types by holding CTRL or SHIFT key. 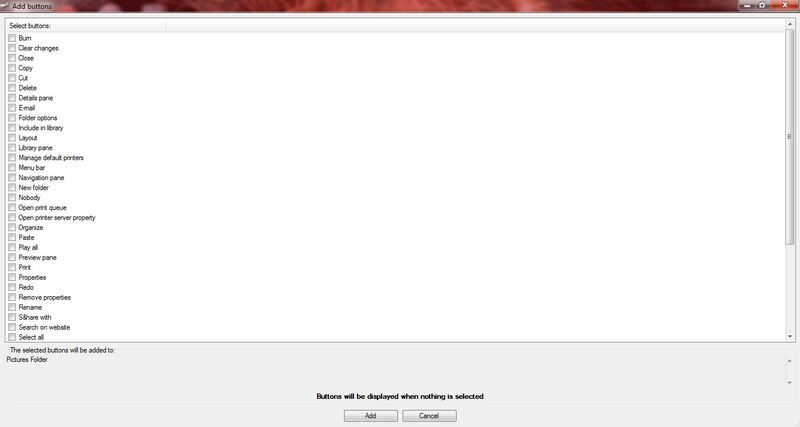 Then click on Add buttons to open the window in the shot below. There, you can select numerous check box to add extra options to the toolbar. Select a few check boxes, and click Add to close the window. If you open Windows Explorer and the folder you selected to add the options to, you should find new buttons on the toolbar. If you added the buttons to a folder with the File or folder tab selected, click on a file to locate the options. In the shot below, I have added new Explorer options to the Pictures folder. To remove buttons, select a folder in the Explorer Toolbar Editor window. Folder buttons are then shown on the right of the window as below. Click on one of those buttons and select Remove buttons. Alternatively, if you’ve added new buttons to a folder you can remove them by clicking Restore Defaults. You can also reorder the buttons on the Windows Explorer toolbar. Select a button on the right pane, and then use the arrows to move it to an alternative position on the toolbar. Explorer Toolbar Editor is a great tool for configuring the Windows Explorer 7 toolbars. Now you can add a much wider variety of folder/file options to its toolbar, and remove any that are not so essential.